First off I’d like to say that ‘Of Blood And Bone: Episode 2: Forsaken’ has arrived! Check that out and let me know what you think. I bought this game originally for the Xbox, but I never got around to beating it. That’s not because it wasn’t a fun game, more a combination of my own inability to stick with a game for the long haul, and the fact that my save gave corrupted after a many hour session one night. So what is this game and what makes it so interesting? First of all the setting is completely unique. You play as the Stranger, an odd dog like, bipedal character. The world is filled with odd creatures, mostly chicken people, frog people and some weird troll looking things. Even your ammo is weird. 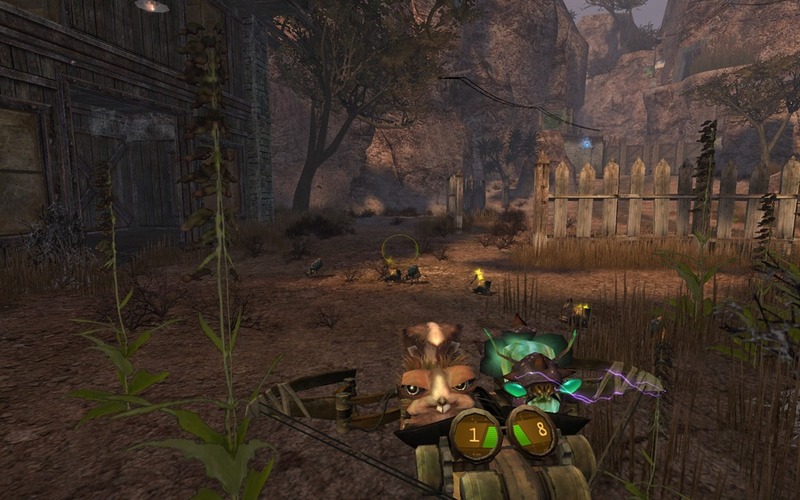 Stranger uses a crossbow set up to shoot creatures you find around the landscape. Each creature has a unique effect, and most of them are not your standard shooter stuff. Stranger is a bounty hunter first and foremost, so you’ll want to take you enemies, even the bosses, alive if you can. You’ll just get more money that way. To that effect you have several weapons designed for live capture. The first, and most important type of ammo, is an electric beetle of sorts. It can fire like a really weak sub machine gun, or it can charge up to fire a larger electric shock that will put most enemies down for a few seconds, allowing you to bounty them up. You’ll also receive spider ammo that, as you might have guessed, wraps the enemy in webs. From there the weapons get more exotic, from squirrels that talk trash, luring enemies toward them for traps, to skunks that cause all enemies in the local area to vomit. You’ll get very few snippets of story throughout the game, at least until you near the ending, but what is there is just enough to drag you into this world and get your mind racing, trying to figure out what exactly is going on. There is a strong ‘Cowboys vs. Indians’ feel going on toward the later half of the game, where you’ll realize that Stranger is a native, fighting the oppressive invaders by using the land, and it’s creatures. Meanwhile the invaders are using black powder weapons and working to slaughter the indigenous population. I didn’t enjoy this aspect of the game, and it really felt layered on thick by the end. The game gets downright beautiful at times. All in all the game was a fun, with a truly unique setting that I really wish was still in games. I wouldn’t recommend it for anyone that hadn’t played and enjoyed the original however, as at $9.99 it’s an expensive older game. For anyone looking for an old school, no-cover shooter with an interesting twist, if you don’t mind older graphics, you might want to check out a few videos and decide for yourself. The second game I beat this week is Dragon Age II. I know I know, a big game like DAII and I hadn’t beaten it yet? Truth be told I hadn’t gotten even to the deep roads until this week. It just never grabbed me like the original, at least not at first. 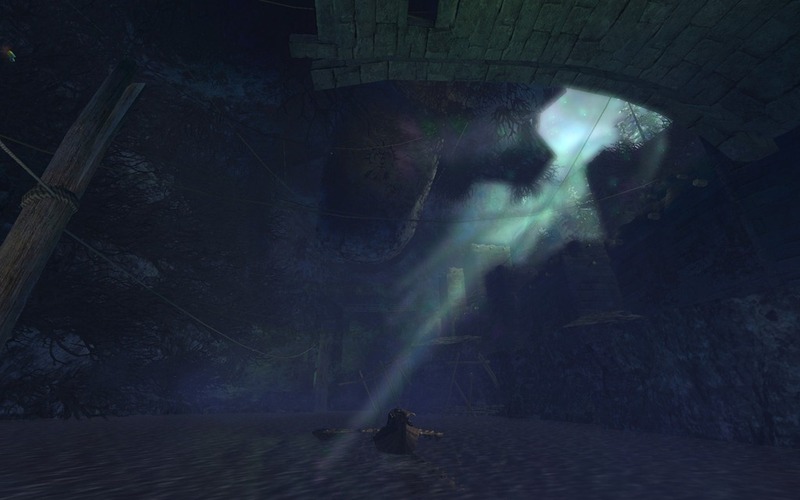 I don’t agree with most of the reviews, that the game is a far cry from the glory of DAO, but I do think that the game isn’t quite as good. Why? 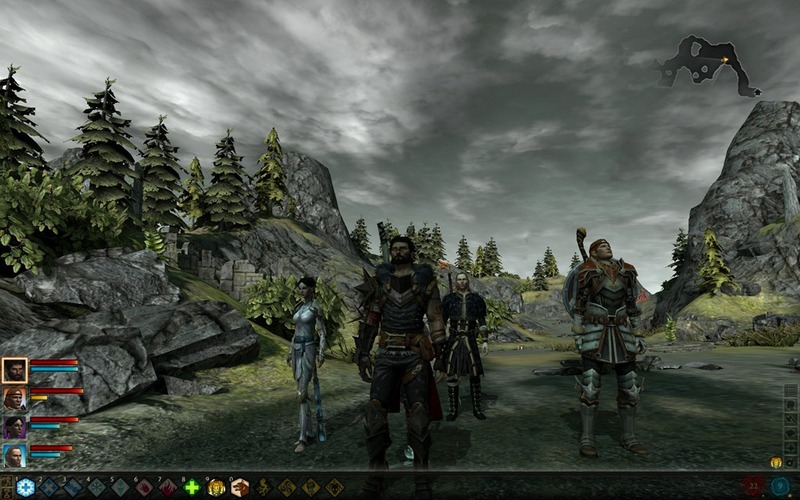 The story of Dragon Age Origins was epic. You played as one of the last few Grey Wardens in Ferelden, most of your order having died, and you had to not only stop the Blight, but also stabilize the kingdom and unite all the races, at least for the battle against the Blight. The story in Dragon Age II is about a refugee who is trying to become rich. You do some good things as you go, and some terrible things, but all the while your pretty much just out for yourself and your family. Not only that, but the game also has around fifteen endings, much like the last Lord of the Rings movie, before it finally does end. DAII can be beautiful, if your rig can handle it well. I will say that your companions are much better than the companions in Origins. Sure, there was no Alistair or Morrigan, but I thought Fenris, Varric, and especially Merrill (OMG so freakin cute) were the best Bioware companions yet. By the end I wanted to stab nearly all of them in the chest for their doing just blatantly stupid stuff, but that doesn’t mean they aren’t really enjoyable for most of the game. I love the style they’ve added into the Dragon Age world as well. The Qunari are much more impressive now than they were in Origins, and the elves look almost alien with their noses, eyes and body shape. It really does a lot to add to the world of Dragon Age and make it more unique. Sadly you don’t see much of the world in this game. In fact, other than two or three locations outside the city, you are pretty much stuck questing inside the city in repetative corridors that’ll remind you more of recent Final Fantasy games than a more western RPG. The combat is an interesting mix. They’ve made the spells and abilities you and your companions can get much more interesting than in the first game. Sadly the combat itself feels a little rushed, and by the end of the game you won’t be getting anything from fighting other than XP, and you’ll be in fight after fight just walking down the street. It reminds me of the horrible random encounters of yesteryear. Still, all of this was made worth it at the end of the game. The big twist there had me jumping in my seat and shouting in excitement, and then suddenly subdued and not sure what action to take afterward. It left me thinking about what I had done, and what I could condone. I wasn’t expecting that, and I think overall it bumped the game up from a solid B, to a B+. Most of these games have longer play times. 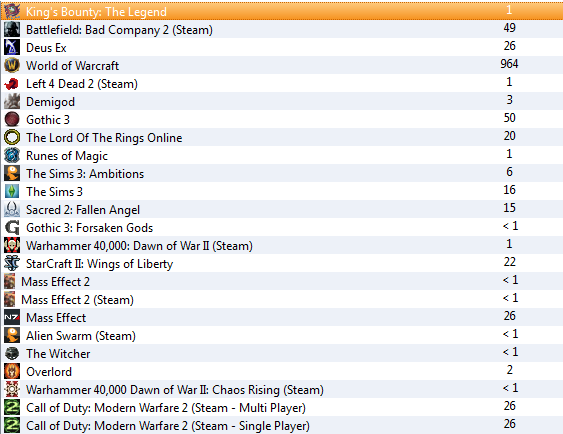 This is just since I installed Raptr, and those games I haven’t uninstalled after playing to free hard drive space. Some games deserve amazingly long play times. Sometimes it doesn’t seem like it’s been as long as it has. Take Dragon Age for example; when I finished my first playthrough I had 80+ hours played. I felt like I had just started playing three days ago and I was enjoying the game so much I immediately started another playthrough. Some people seem to think that the longer a game is, the better. This is especially true with RPGs. If it’s not at least 40 hours of gameplay then most people, “professional reviewers” included, will slam it. Meanwhile if I want to finish a game like Gothic 3 I’ve got to put in 50 or so hours. That doesn’t make the game better. Sure, having all that content on the side, in perhaps a sandbox style after you beat the game, would be fine with me, but honestly I was ready to be done with Gothic 3 at the 20 hour mark, and the longer I played the less I enjoyed the game. The less I enjoy the game at the end, the less likely I am to buy into the franchise in the future, which is the goal of the gaming industry at the moment. That’s not to say that I want all games to be under 10 hours, not at all. It’s just like a book in my opinion. There is an unspoken limit to how short it should be at the minimum, and how long at the maximum, and if you go outside this range you better have a good reason. For instance, Portal. Only 3 or 4 hours long it was an amazing game, at a discount price. If it had come out at $60 it would have flopped. On the other hand we have Dragon Age, with over 80 hours of gameplay on a single playthrough, it didn’t ever feel padded or like there were really hard moments just so you would die a bunch and pad the game time. Of course none of this applies to something like online play, whether it be some kind of PVP thing like the online portion of Modern Warfare or Online only like an MMO. It also doesn’t apply to second playthrough’s or other types of game options, only to the main story. In short: If people are getting bored with your game before the end, it might be time to cut some content.